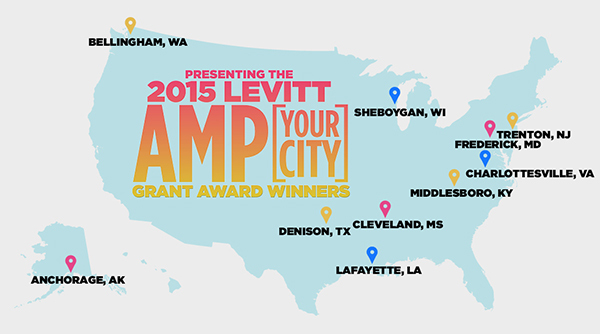 Winners Announced for the Levitt AMP [Your City] Grant Awards! The votes have been tallied and the review process has come to an end. The moment we’ve all been waiting for has finally arrived! Today Levitt Pavilions and the Mortimer & Mimi Levitt Foundation awarded $250,000 in matching funds to 10 nonprofits serving small to mid-sized cities across America to present free outdoor concerts as part of the first-ever Levitt AMP [Your City] Grant Awards. A new chapter of Levitt history has begun! 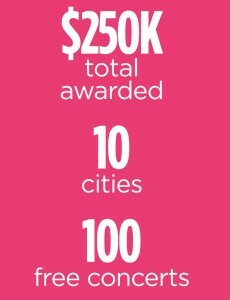 WHO was invited to apply for up to $25K in matching funds? U.S.-based nonprofit organizations, and municipalities partnering with a nonprofit, serving cities with metro populations of up to 400,000. WHAT were project proposals asked to demonstrate? – May 1, 2015-April 30, 2016: Levitt AMP Music Series! WHERE: From sea to shining sea! WHY: Impactful creative placemaking projects come in all shapes and sizes. While Levitt’s signature creative placemaking program is tailored to large cities with metro populations of over 400,000, the Levitt AMP [Your City] Grant Awards are designed to meet the needs and capacity of small and mid-sized cities. The 10 Levitt AMP grant recipients were selected based upon the projected impact of their proposed concert series, feasibility of implementation, displayed community support, and overall alignment with the goals of Levitt AMP. ADP (Anchorage Downtown Partnership) Community Services will present the Levitt AMP [Anchorage] Music Series to infuse energy into Town Square Park, bringing momentum to the city’s revitalization efforts and enriching residents’ lives. The Downtown Bellingham Partnership will present the Levitt AMP [Bellingham] Music Series in two locations—at the underused Maritime Heritage Park and on Bay Street, expanding upon their efforts to use the arts to revitalize and improve their downtown. 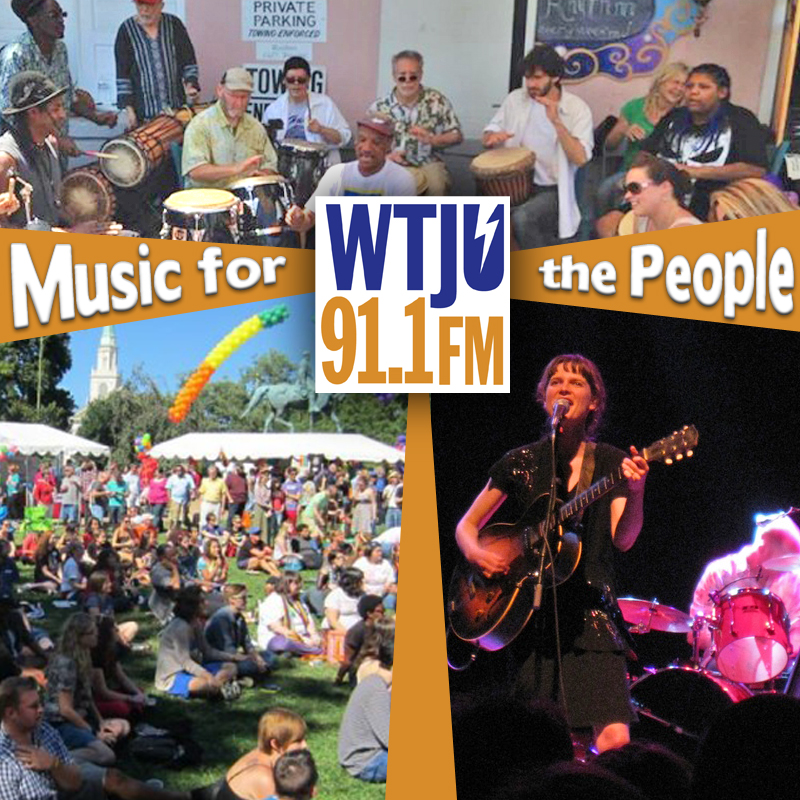 WTJU radio station will enliven IX Art Park, the recently launched public art park in the heart of Charlottesville’s Strategic Investment District near the University of Virginia, bringing together the city’s diverse populations and enriching community life through the Levitt AMP [Charlottesville] Music Series. Delta State University Foundation will present the Levitt AMP [Cleveland] Music Series to invigorate the underutilized Green Space on the Crosstie Walking Trail at College Street, honoring the Delta’s rich musical legacy in conjunction with the historic launch of the GRAMMY Museum Mississippi. Denison Main Street Inc. will strengthen its city’s social and economic fibers by expanding the much-loved Music on Main concert series in Heritage Park, a centrally located series that celebrates inclusivity, engagement and accessibility through music, to become the Levitt AMP [Denison] Music Series. The Downtown Frederick Partnership will present the Levitt AMP [Frederick] Music Series to activate the underused Carroll Creek Park Amphitheater and celebrate local culture, providing residents with a place to gather and enjoy a diverse mix of talented emerging artists. 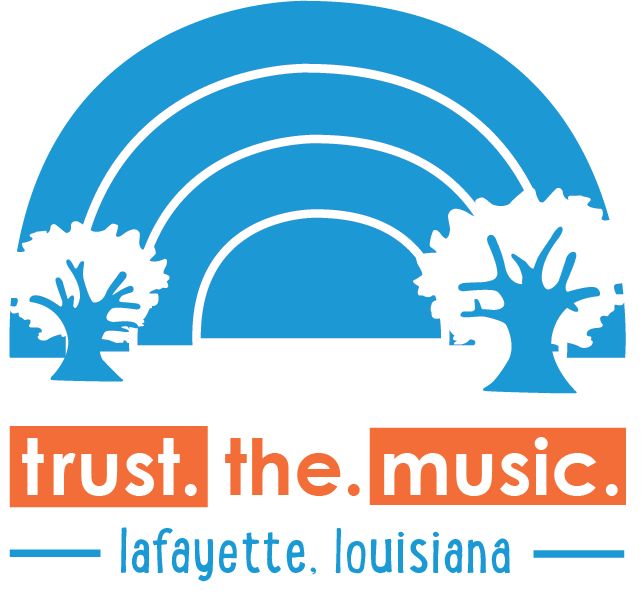 The Lafayette Public Trust Financing Authority will bring new life to The Park at the Horse Farm with the Levitt AMP [Lafayette] Music Series, reinvigorating this beloved undeveloped piece of Cajun Country recently saved from commercial development by a community-wide effort. Discover Downtown Middlesboro will transform a centrally located vacant gravel lot on Cumberland Avenue into a gathering space, using the Levitt AMP [Middlesboro] Music Series to bring residents together and augment the city’s community-driven revitalization of downtown. The John Michael Kohler Arts Center will bring life to a new public space on the site of a former Boston Store, using the Levitt AMP [Sheboygan] Music Series to bring diverse audiences together and create a vibrant, public space in the city’s downtown core in need of rejuvenation. Trenton Downtown Association will use the power of the Levitt AMP [Trenton] Music Series to enliven the unused and historic Capitol Green public space, igniting community pride in the State’s Capital and encouraging residents to engage with the city’s rich cultural and historical offerings. Collectively, the 10 winners will present 100 free concerts in 2015 as part of the Levitt AMP Music Series, which will feature a diverse lineup of high caliber entertainment, in keeping with the hallmarks of the signature Levitt program. While the selection process has come to an end, this exciting new program is just getting started! We cannot wait to see these projects come to life and invigorate public spaces from coast to coast. Congratulations to all the winners of the Levitt AMP [Your City] Grant Awards! This entry was posted in Concerts, Levitt AMP, Levitt in America, News and tagged Levitt AMP, Levitt AMP Anchorage, Levitt AMP Bellingham, Levitt AMP Charlottesville, Levitt AMP Cleveland, Levitt AMP Denison, Levitt AMP Frederick, Levitt AMP Lafayette, Levitt AMP Middlesboro, Levitt AMP Sheboygan, Levitt AMP Trenton on December 15, 2014 by Nicole McGaffey.